Doctors know well that the holidays bring an upturn in families noticing worrisome signs of memory loss in older adults. No disrespect to Santa intended, but Jolly Old St. Nick also shows a worrisome number of not-so-jolly potential symptoms of dementia. Only a doctor, of course, can diagnose Alzheimer’s disease. But Mrs. Claus would do well to take a closer look at the following warning signs, which warrant a cognitive evaluation and medical exam in order to rule out other possible causes of dementia or — though it seems impossible to imagine in someone known for his ho, ho, ho — depression. 1. Santa keeps making that list and checking it twice. People with early memory loss are often aware that they’re slipping, and they struggle to employ strategies to help them keep track. Writing notes to themselves is one way they do this. Eventually, though, the person with cognitive trouble forgets ever having written a list in the first place and then never consults it later. Why does Santa check his list twice? Maybe he’s just careful — after all, it’s a long list. But obsessively checking and rechecking a note or the clock — often because you literally can’t remember just having done so — is a common sign of memory loss. The ability to record these new memories is impaired. 2. He wears the same clothes over and over. Have you ever seen Santa wearing anything besides that fur-trimmed red suit? Wearing the same clothes repeatedly is another hallmark of advancing cognitive difficulty. It’s possible, of course, that the red suit is just Santa’s chosen uniform, a la Steve Jobs — but even Jobs ditched his signature black turtleneck and jeans for sleeping or sports. If Mrs. Claus has to sneak the suit out of the room at night in order to wash it every now and again, or if there are blue and yellow suits hanging in the closet that never get selected, she might consider this a red flag. 3. He needs a red-nosed reindeer to direct him on the same route he’s driven for years. You’d think Santa would know his worldwide sky routes like the back of his hand by now, instead of having to seek out a bright-nosed reindeer to lead the way. But getting lost on familiar routes is often one of the earliest memory symptoms families notice. One classic clue: driving the same way for years but suddenly having moments of confusion during which he or she isn’t certain of the location or destination. Both memory loss and “motion blindness” — the ability to perceive motion well and navigate the environment — are to blame. If kids in Tokyo or Toledo wake up without any toys this Christmas, it just might be because Santa got lost in Tibet. 4. He’s getting up there in years. Alzheimer’s disease isn’t an inevitable side effect of aging. But the odds of developing it do increase with age. As many as one in two people over age 85 have signs of dementia. And Santa is how old? Multiple centuries? Spend a few minutes with someone with mild dementia, and repetition — of questions, comments, and even word-for-word long anecdotes — is often apparent. The person may seem to get stuck on just a few phrases with certain people or in certain situations. Always asking a grandchild, “How’s school?” or an adult child, “How’s the family?” for example, are helpful crutches that the person with mild dementia may use to mask an underlying uncertainty. Makes you wonder what Santa has ever said to a child around the globe besides, “What do you want for Christmas?” and “Have you been good?” You’d think he’d have plenty of stories and advice to share, but we just don’t hear it. The exact cause of Alzheimer’s is unknown. But scientists have uncovered plenty of risk factors. High on the list: obesity. Santa’s exact weight is unknown, but nobody looking at that bowl full of shaking jelly would place him inside the “normal” columns of the body-mass-index chart. Belly fat (weight centered in the midsection) is clearly associated with an increased risk of Alzheimer’s disease, especially when it accumulates in midlife. People who are obese also tend to develop diabetes and heart disease, which are themselves linked to a higher risk of dementia. It’s hard to understand why Santa chooses to use the chimney over the door, given that everyone’s supposed to be asleep anyway and given how often he flops into fires and ashes. But cognitive difficulties often cause confusion in behavior and language. Misusing words, a part of a general condition of language problems called aphasia, is another common development with dementia. Some people with dementia call a toothbrush a “mouth scraper” or a “thingamajig,” for example. 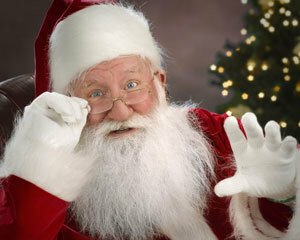 Songs about Santa refer to “rooty-toot-toots” and rummy-tum-tums” for musical instruments. Hmmm. . . .
Here’s hoping those hardworking toymaker elves are also good at caregiving, since — as far as we know — Mr. and Mrs. Claus have no children of their own up at the Pole to step up to the demands of the job.